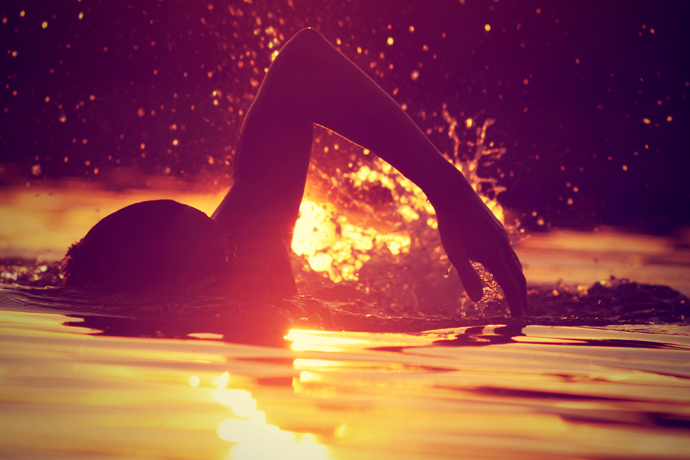 Do you watch seasoned swimmers with envy as they glide effortlessly through the water? Or did you take swimming lessons as an adult, only to find out that you could hardly swim any better after weeks, months or even years of instruction? Well, it doesn’t have to be this way! Learning to swim should be an enjoyable experience. 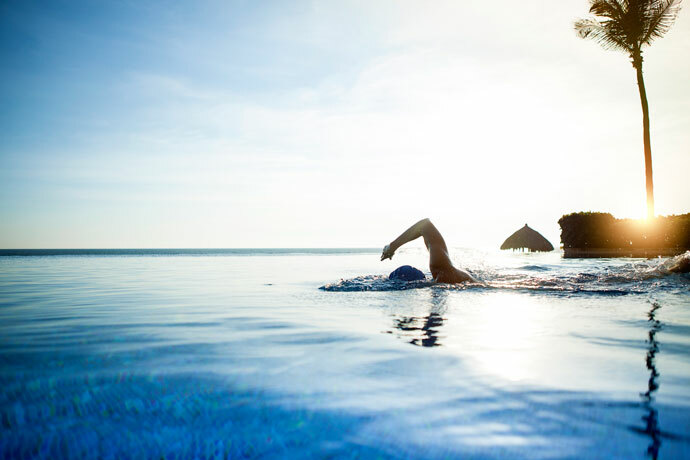 On this website, you will learn that by practicing progressive swimming exercises with the proper mindset, you can quickly learn each swimming stroke, step by step and while having fun! 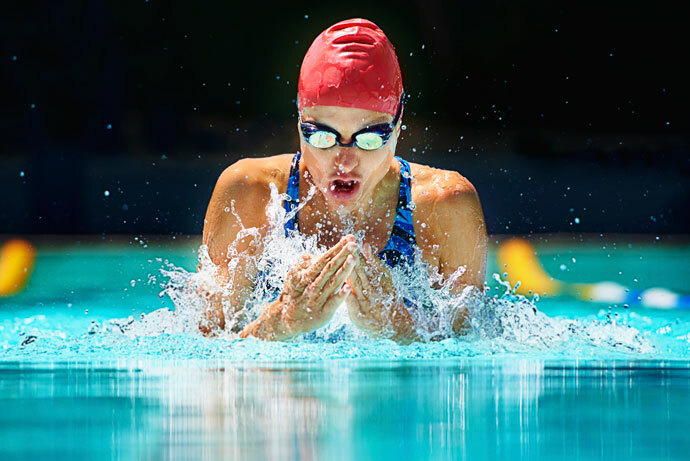 This section of the website features swimming exercises to either learn how to swim if you are a beginner, or to improve your swimming technique if you already have a degree of proficiency in one or several swim strokes. First of all, if you are a beginner, you can start with our basic swimming techniques to get accustomed to being in the water and learn how to stay afloat. After this, you can learn each popular stroke one step at a time using progressive swimming drills. Front Crawl Drills: This sequence of swimming drills let you first practice the flutter kick, then floating on your chest, on your back, and on your sides. Afterward, dynamic balance is practiced, which lets you float while rolling through different positions. Finally, the arm movements are added. Breaststroke Drills: This sequence of swimming drills lets you practice the arm stroke and leg kick individually, first on dry land and then in the water using flotation devices. Then both techniques are progressively integrated until you can swim breaststroke. 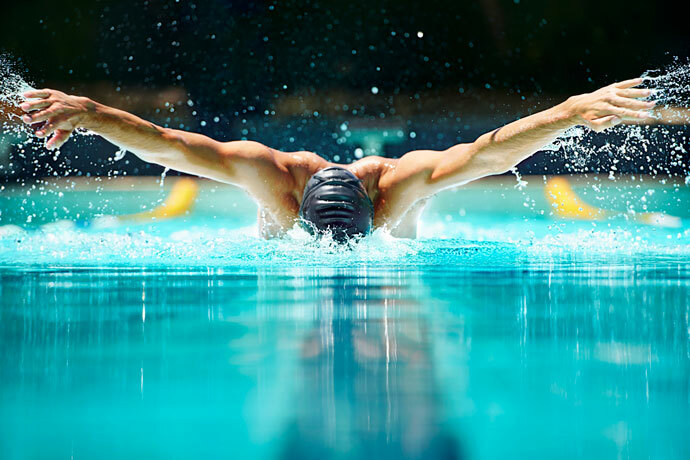 Butterfly Stroke Drills: This sequence of swimming drills first lets you practice the body undulation and dolphin kick, which are prerequisites for an efficient butterfly. Once those techniques have been mastered, adding the arm movements is straightforward and you will be quickly able to swim the butterfly. Backstroke Drills: This sequence of swimming drill lets you practice the flutter kick, static balance and dynamic balance. The focus, however, is to practice those techniques while floating on your back and on your sides. 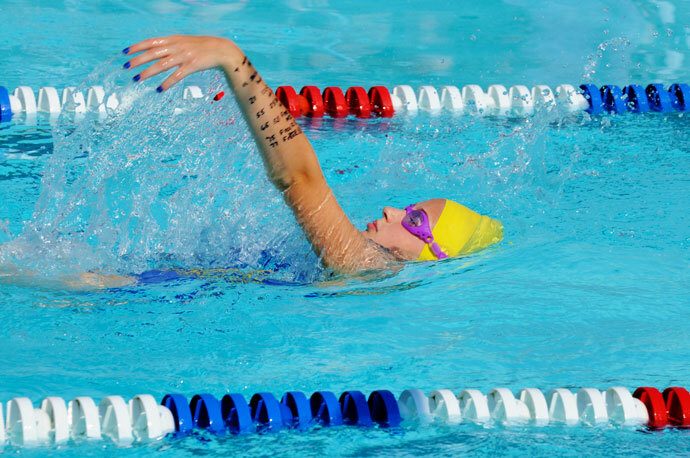 Afterward, arm movements are added up to the point where you can swim backstroke. Sidestroke Drills: This sequence of swimming drills lets you first practice the arm movements and scissor kick individually on dry land. Thereafter those techniques are practiced individually in the water using flotation devices. Finally, you will combine both techniques and swim the full side stroke. Fine-tuning your swimming technique: Learning each swim stroke should keep you busy for quite some time. Once you have achieved this, here are a few additional articles that will allow you to fine-tune your technique. This section of the website gives an overview of the most popular swimming strokes in use today, then describes the swimming technique for each stroke in more detail. Front Crawl Overview and Technique: Also known as front crawl, this is the fastest and most efficient of all swim strokes. 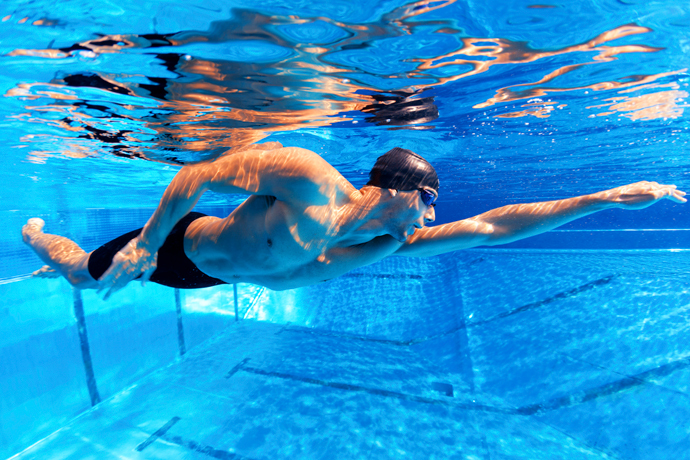 Because of this, it is the favorite swim stroke of many fitness swimmers and triathletes. Breaststroke Overview and Technique: This is often the first of the competitive swim strokes taught to beginners. The advantage of the breaststroke is that in the beginning the head can be kept out of the water, which avoids breathing issues. Butterfly Stroke Overview and Technique: This is the second fastest and most exhausting of all swim strokes. However, swimming a few lengths of butterfly is a lot of fun because its movements are unlike any other stroke. Also, when you swim butterfly, you always get a lot of attention, because it is such a spectacular stroke. Backstroke Overview and Technique: This is the sole competitive swim stroke swum on the back. Slower than butterfly but faster than breaststroke, it is often prescribed by doctors to patients that suffer from back pain. This section covers additional swimming information that will be of interest to improvement-minded swimmers. Swimming Equipment, Gear and Accessories: So you want to take up swimming and are unsure which gear and accessories you should get? Well, have no fear! 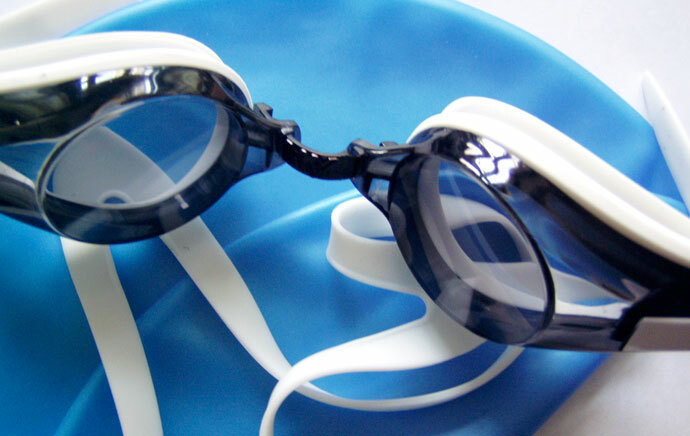 This section provides tips, tricks, and reviews to help you choose your swimming equipment. Swimming tips: We also cover various tips about breathing technique, teaching yourself how to swim, etc. 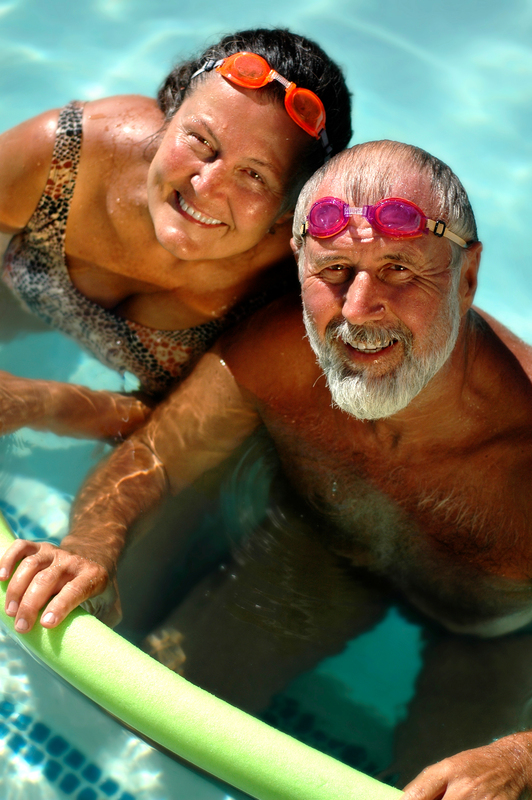 Swimming Information for Health and Safety: Swimming is an excellent sport that can be practiced at any age. It has a lot of benefits for the mind and the body. Nevertheless, there are certain issues to be aware of so that you can avoid injury and enjoy swimming for the rest of your life! These issues are covered here. Swimming Resources: Gives an overview of interesting swimming resources located on this and on other websites. I have a question, how on earth is such a simple website so goddamn awesome and amazing?!!?! I mean this is one of the most perfect websites for beginner novice amateur and professional swimmers all alike! I am a proud user for over a month! A month back I didn’t know how to swim, now I do 50m laps regularly and can do the butterfly!! Thank you very much Enjoy Swimming! How interesting. 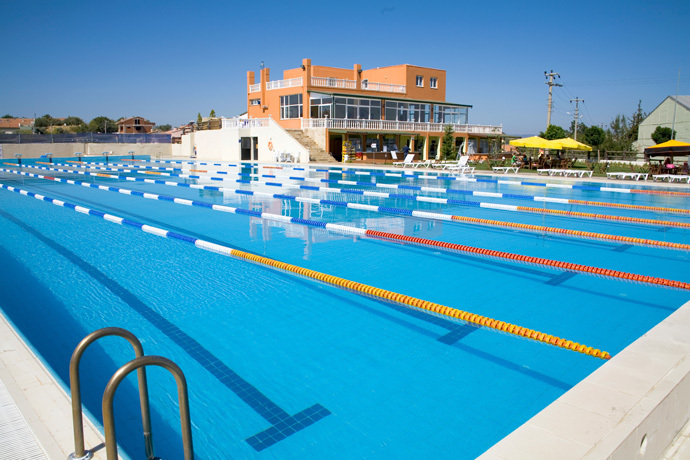 Your site so captures the feeling of swimming that I can almost smell the chlorine! Many thanks for your efforts of professional advice. Below is the link to the video of my front crawl swimming. I feel that when I am on the left side and breathing in, my trunk sinks. What is the reason? When I rotate on the right side, no sinking. 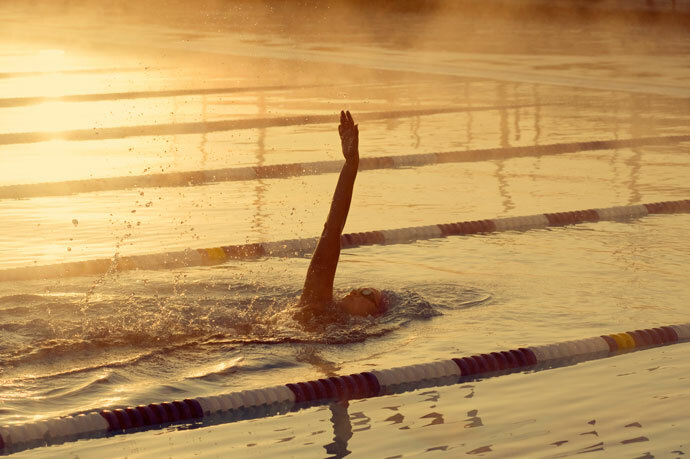 Sometimes when I get tired this sinking is the reason that there is not enough time to breathe in and then I start the left-hand-catch stroke earlier when the right hand just starts recovering from the water. There is something wrong with the body balance… I want to glide effortlessly and enjoy swimming. In your video, I see that you keep your arm extended forward, without moving it down as you breathe. I know that this is recommended by TI, but personally, I have moved away from this recommendation. While breathing I now push a bit down with the extended arm/hand, which helps keep my balance and prevents my head and body from sinking. It also prevents the kind of momentary “freeze” of movements that you display while breathing. I know that Terry writes a lot about the “weightless arm” but in my opinion to be able to pull this off you need to have very good balance skills and possibly a strong kick, à la Ian Thorpe. Another thing I noticed is that you rotate your head a lot to breathe (both lenses of your goggles’ eyecups are out of the water) and you also lift your head slightly. This could be a side-effect of you “freezing” your legs and the arm extended forward as you breathe and sinking. Normally you should keep your head down, in line with the spine, as you breathe. It should feel as if your head is lying sideways on a pillow resting on the water surface. 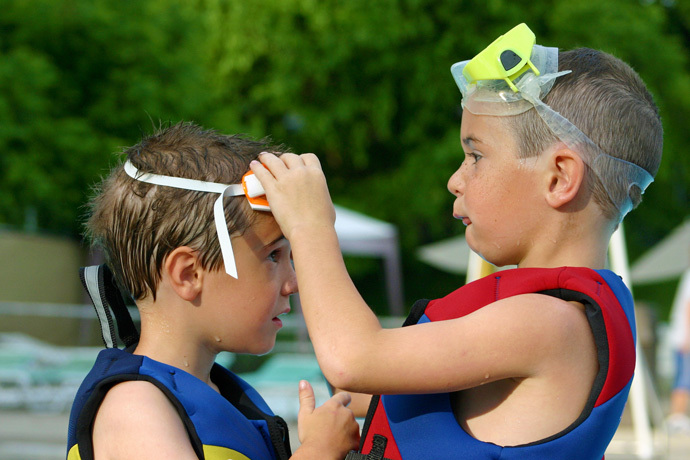 Only one of your goggles’ eyecups should be above the water surface. You breathe in the trough of the bow wave created by your head moving forward. To be able to do this, think about the focal point of resting your head on the water surface as you rotate to breathe. You also need excellent balance. I find that the switch drills (starting here: http://www.enjoy-swimming.com/front-crawl-6.html) are excellent to practice balance with body rotation. Cool love you so much! Awesome… I love this website! Quite helpful… Nice work done bro! Your website helped me. The video tutorial tone was great. On the whole, it was very useful. Like any good site that I want to use my Persian language. Of course, my English is not good because I have a lot of places to improve. Thanks for the kind words. I’m glad that the website was helpful to you. I fear the website will only be available in English for now (and maybe French and German in the near future) as I manage this site during my free time. I am a beginner, it’s been two days since I started swimming. While googling, I found this awesome website. Please let me know if you have any advice for me. Learning to swim takes time, so you need patience. Have just joined middle school swim team Northern Kentucky. Thanks a lot for these great tutorials. You write great content and explain and divide everything very nicely. 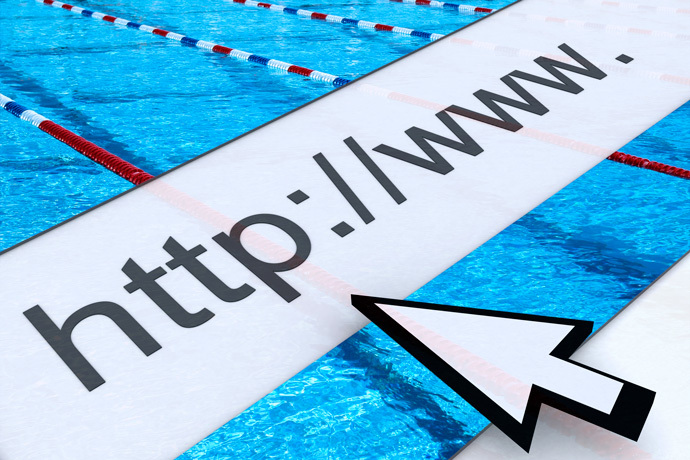 Your website and skillswimming.com are definitely the best swimming lessons related out there. Anyways keep on the great work! Let’s make swimming a popular sport all around the world! Any suggestions for helping my son learn to swim? He can swim miles with no flotation devices if he is wearing mask and snorkel but take those away and he sinks? I would recommend doing the exercises in our drills series for each stroke. I think the best would be if you did the exercises along with him. I’ve got a weak flutter kick, though I’ve been practicing in 25 meter pool for the past year. Doing one length exhausts me, so I alternate with frog kick to build some endurance. I’ve recently discovered the vertical kick, which is obviously a good technique but a bit too strenuous for my poor walking sticks. I’ve also discovered recently the one-leg kick practice, which I can do one length with my “good” leg, but barely a half-length with my weak side. Any suggestions to develop a better balance in leg strength and longer endurance? To be honest, I’m not a big advocate of kicking sets. That being said, when I do them, I find that a swim snorkel helps a lot, as you get enough air all the time, even while putting the head in line with the body. Tomorrow is my first swimming class… I am 35 and have fear of water. I have gone through a lot of swimming-related videos and articles but found your website very helpful as it explains each style in detail with the drills. I hope to overcome my fear soon. I have stumbled across your website and hope that you have some tips for me. I am a 65-year-old female trying swimming lessons for the 3rd time. We have made some progress but since we have started working on the front crawl I have hit a wall. I simply cannot get my head around getting the kicking breathing and arms all working together. If I concentrate on two such as the arms and legs everything stops if I try to breathe. It is so frustrating. Do you have any advice or drills that I can try? I have another question regarding a blog I watched to prevent legs and hips from sinking. It said to increase the downward pressure on the chest and head. How do you do that? It isn’t a quick fix, however, expect to spend a few weeks working through those drills. Many thanks for sharing your skills & experience on this most EXCELLENT & INFORMATIVE website. The story of my own encounter with swimming is very SIMILAR to that of yours. So, yes, I can certainly relate. And, now, I have to get back to working on my Side-Stroke. Are water aerobics or aqua fit as good as swimming.